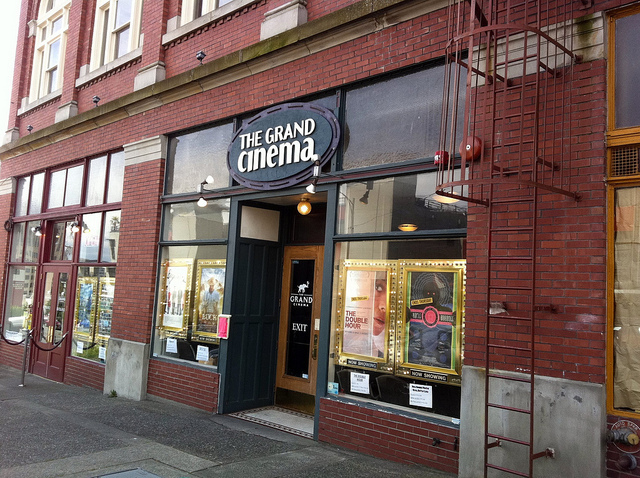 The Grand Cinema, another thing that makes Tacoma great! I’ve been wanting to see the Woody Allen’s new movie Midnight in Paris and today was the day. It is playing exclusively at the Grand Cinema at 606 South Fawcett Avenue, Tacoma, WA and that is great, since it is one of my favorite theaters. It was a wonderful movie that made me want to book a ticket to Paris right away. I was especially glad to see it since my book group is reading Tender is the Night this year and F. Scott Fitzgerald is one of the characters in the film. The Grand Cinema is a nonprofit, art house theater and its mission is to enhance the cultural vitality of the community through the art of film. Their selection of movies is very thoughtful and they show films that often just aren’t available any place else in Pierce County. In addition their theaters are comfortable, the snacks extra good and the mostly volunteer staff is excellent! This entry was posted in Art -- there is art here!, Non Profits, Performance Places, Tacoma, WA State - Pierce County and tagged book club, community art, F. Scott Fitzgerald, films, Grand Cinema, Midnight in Paris, movies, snacks, theater, theatre, vitality, Woody Allen on July 18, 2011 by admin.